Awards: Winner of the Filmfare Special Jury Award, and of the Stardust Award for Breakthrough Performance Male. He got nominated to the post of Filmfare Award for Best Supporting Actor and for the Star Screen Award for Best Promising Newcomer Male. Trivia: Prateik is a Marathi by birth. He is born to the eminent Bollywood couple- late actor Smita Patil and Actor-turned-politician Raj Babbar. He came to public recognition as an acclaimed face on television from the time he started doing advertisements. His ambition since childhood was to play for India team. He used to play cricket every weekend in Bandra post school hours which gave him ample contentment. He has been always on the silent note about his mother, the then acclaimed actor of Bollywood. He was the heretic yet cool guy at school. His count of girlfriends at school was abounding. He did not even miss the chance with the seniors on this ground. Had the stature of sneaking into girls’ hostels during this time. Biography: The calm and composed rising star in Bollywood stepped into his parents’ shoes finally after a lingering series of advertising in collaboration with different companies. He made his debut in television with the very advertisement of the chocolate company of Nestle Kitkat. His yearlong assistance to advertisement filmmaker Prahlad Kakkar, served him his fortune’s worth. He was even assigned and recommended by him to other advertising organizations. The grunt yet jittery hunk of Bollywood has acting as an intrinsic trait in his genes. Through his offbeat roles in his films, this introvert boy of Bollywood has made a mark in tinsel town. In 2008, his debut movie “Jaane Tu Ya Jaane Na”, won innumerable plaudits for theimmaculate deliverance of his character as a debutant. It was a moderate budget movie under the banner of Aamir Khan Production. With this pristine work at the very kick-start of his career, his acting skills came to recognition as his forte. His portrayal of the very supportive brother of Genelia D’Souza as Amit, in his debut movie “Jaane Tu Ya Jaane Na”, was worth a million watch. The movie had Imran Khan and Genelia D’Souza as its cast along with him. He has grown as an actor in a very small span of time. He played the role of a rugged dhobi who was also a wannabe model. His performance was splendid in Kiran Rao’s directorial debut Dhobi Ghat. This movie too belonged to Aamir Khan Productions. He then continued his relentless effort to do something different and edgy. With a striking NRI accent he suavely performed in Prakash Jha’s Aarakshan. He did a fab job of a supporting caste which formed an important part of the film. 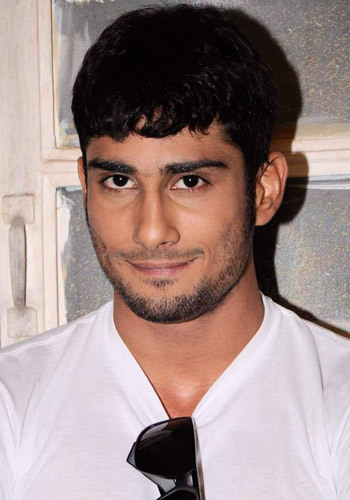 Prateik also did a rom-com flick with Sanjay Leela Bhansali which was My Friend Pinto which did not do very well in the box office. He was paired opposite Kalki Koechlin in the movie. He recently played a madly-in-love guy next door in Gautham Menon’s Ek Deewana Tha’ opposite Amy Jackson. The song ‘Hosana’ from the same movie went on to be one of the chartbusting romantic numbers of the year. This lad has been quite successful in amassing quiet a big number of fans specially young girls. Hope his upcoming ventures will be far more commendable and edgy!